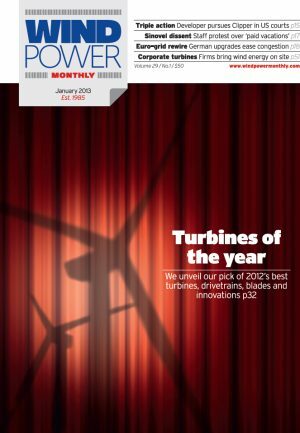 Windpower Monthly is the leading news magazine of the international wind energy business, publishing non-stop since 1985. Fiercely protective of its independent status, the magazine provides balanced quality information on wind power and only wind power. Our focus is on business, policy and economics. Windpower Monthly's authoritative articles from around the world provide a concise yet detailed overview of the essential political, industrial, environmental and technical developments in the global wind energy arena. National news updates are backed by regular charting of market forces, thought-provoking editorials and incisive analyses of business and economic trends. No other publication offers the same depth and breadth of global news reporting in this specialised field of power production. We provide a magazine for as broad a readership as possible, which nonetheless remains an essential tool for all involved in the job of clean power supply. It is our aim to increase your awareness of the role being played by an important new technology in electricity generation — and of its potential to play a far greater role in meeting a fundamental need of tomorrow: the clean, safe and economic supply of electricity to all. We’re independent of the wind industry and we offer an accurate and balanced perspective in all our reporting. With more than 27 years of expertise we ask the right people the right questions leading us to the exclusive angles and in-depth coverage that our readers value. We put complex information into context clearly and concisely, avoiding the use of confusing jargon and clarifying it when required. Our global reporting team uses its expertise to focus on the issues today that the wind industry will be talking about tomorrow. All content is subjected to rigorous scrutiny, analysis and fact-checking, a dedication to accuracy that our reputation was built on. We report what’s important when it matters to ensure our readers have the right information when they need it. Always seeks to take an independent and objective view, challenging received wisdom. Always uses the knowledge accumulated over 27 years to assist in making informed judgements. Always seeks to identify the global implications and connections of disparate developments. Always subjects content to rigorous scrutiny, analysis and fact-checking. Always provides timely and perceptive analysis of what really matters. Always seeks to satisfy the wide-ranging demands of our audience through the provision of high-quality products. Always identifies the barriers hindering the global spread of wind power and searches out and reports solutions to them.